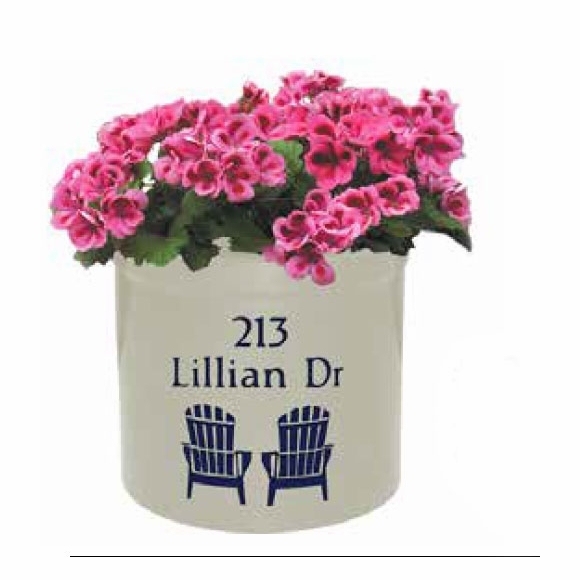 Personalized Colored Stoneware Address Crock - - 2-gallon pottery crock personalized with your name or address. Made in the USA. Ivy crock is decorated with a chain of ivy under the two lines of personalization. Mare & colt "Fairy Tale Farm" crock with a soothing pastoral scene. Crock displays two lines of personalization. Each line holds up to fifteen (15) 1" characters (including spaces). Our food-safe pickle crocks are a true All-American product. Manufactured from clay found in the famed Roseville area of southeastern Ohio and fired there in century old kilns. Decorated and personalized in Connecticut. Designs are deeply carved and clear coated for durability. Crocks are oven safe and dishwasher safe. For indoor and outdoor use on the front porch steps or by the hearth. Imprint colors: black, green, red, blue, or brown. Personalization and design color as shown above. A personalized stoneware crock makes a great gift for any occasion including a wedding, anniversary, housewarming, or birthday. Crocks can be used as planters, ice buckets, and containers for kindling, magazines, yarn, and knitting projects.